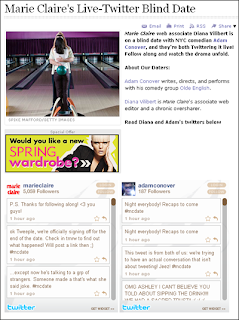 Youre currently reading Tweeting During a Blind Date: Marie Claire, and Creating Moving Experiences. Twitter is so much about timing. I just happened to be interacting with Rob when he began to prepare for his blind date. Being in the Single Life biz (Singelringen & SingularCity), and at the same time a genuine cyber pal of Rob's, I was fascinated when he mentioned he would tweet his blind date. It was definitely a fun night. I certainly wouldn't recommend tweeting on a blind date if you actually want it turn out. A few tweets in the bathroom is one thing but no one is going to be turned on by full time tweeting. Great to catch up with you, Linda. I was able to tweet a bit with Rob last night, and he got a kick out of the story. As it turns out, he also did a job interview over Twitter. Now that's being a pioneer. I wonder what's next; doing your taxes over Twitter?